Indeed China as many rules and regulations. Understanding these requirements is a big challenge. Our back-office services relieve you of cost, complexity, and risk - allowing you from Day-1 to focus on your core business objectives! Import/Export requires several types of licenses that are issued by commodity-type. We maintain a wide range of licenses allowing us to import, export, inventory, and distribute products. In case we do not already possess the licenses required for your commodity category, we will procure them. We provide complete fulfillment services including inventory, inventory management and reporting, receiving, repacking, labeling, shipping, and returns from our three fulfillment sites in Guangzhou, Shanghai and Beijing. If you have not yet formed a legal entity and committed to local Finance staff, you will need a basis for transacting business. A few larger clients in China can transact business in foreign currency, in which case, you don’t have a problem. Most local firms however will only transact business in local currency. In this case you need a solution. We have multiple solutions for this challenge, depending upon the specific circumstances and can manage all aspects of local financial requirements. It is important in China to be seen as committed. Having a great product and great success in the West has less influence on Chinese decision-makers than in the West. One of the first questions you will often hear is, “Do you have business in China?” By this question the client is trying to measure whether others trust you or not. If you have no current business in China, a critical step required is to demonstrate commitment by having a proper footprint. This can be as simple as having an office address, some level of staff and some level of in-country management to help speak on a daily basis on behalf of headquarters. A variety of temporary business services ranging from HR to Finance are required to get a good start in China. We can arrange all of the required business back-office services you require at costs and risks lower than hiring in China. Finding qualified staff in China can be challenging. Most industries are relatively new to China, thus the pool of qualified staff may be limited. We know the people; the “people who know the people” and can help you. When you are ready to add staff but are not ready to form a legal entity in China, you will need a legal basis for hiring and administering your new staff. We can provide these services for you. At some point you will need some short-term office space. There are a variety of providers for these services. Some over-commit and under-deliver, while others are superb. We have our own shared space and are familiar with most of the third-party providers. We will guide you to the solution that best meet your needs. 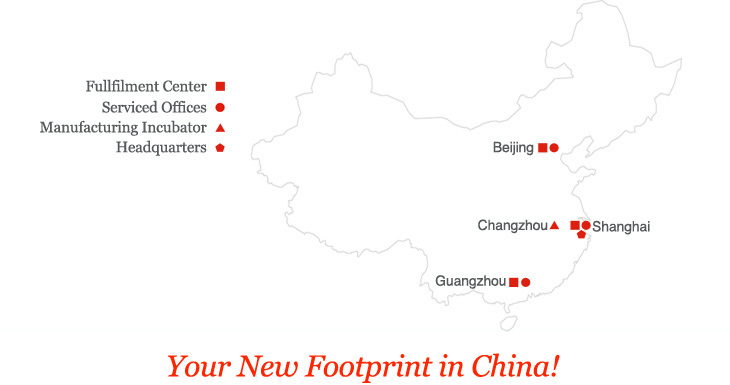 Our own locations for office space include Shanghai, Beijing and Guangzhou. There will come a time when you are ready to commit to legal entity formation. This decision is NOT to be taken lightly, however. There are many choices from Representative Office to Wholly Foreign Owned Entity (WFOE). Each is designed for different purposes and has their strengths and weaknesses depending upon your objectives and your stage of market development in China. We can guide you through this decision-process and indeed through the entire execution-process of forming a legal entity. General legal help is rarely required during the early years in China except perhaps for development of some fairly standard contracts. In case of need, we are able to connect you to highly capable, trusted local firms. so you can focus on business!